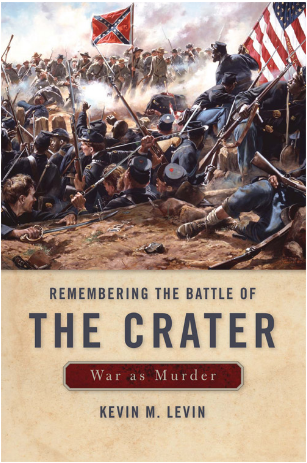 Remembering the Battle of The Crater: War as Murder by Kevin Levin published by University of Kentucky Press (2012). I purchased this volume with some trepidation. Its author, Kevin Levin, is not just a historian and an educator, he is also arguably the most popular Civil War blogger on the net. I began reading him several times a week beginning back in 2010 when I was first contemplating my own Civil War project. My worry was that since I had read nearly everything Mr. Levin had written over the last two-and-a-half years on his Civil War Memory web site, would the book be just a reduction of that writing to paper? While what I read on Levin’s blog has echoes in the book, in fact it is an altogether different product of Levin’s research and ruminations from the dozens of blog entries that preceded its publication. The book itself consists of three different sections. The first describes the brutal Battle of the Crater outside of the Virginia city of Petersburg in 1864. If you’ve read the novel Cold Mountain or seen the movie of the same name, that fictional work begins with explosions under the Confederate lines that created the Crater. 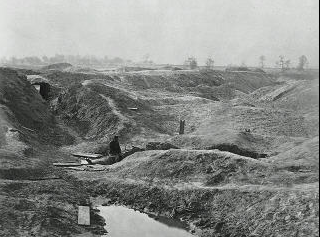 The devastation temporarily disorganized the Confederate defenders, Union troops poured into the smoking hole, the Confederates counterattacked and overran the Northerners, massacring black Union troops. The book looks at how Southern whites interpreted the battle at the time. Confederate soldiers wrote home that black troops had been deployed by the thousands to serve as a warning to home folks that an army of black avengers was descending on the South and that all whites had to mobilize to defend their society against this revolutionary force. They also bragged about killing captured black soldiers, equating the murders of black soldiers, illegal under the laws of war, with the accepted killing of rebellious slaves by their white owners. To white Southerners, the blacks were not soldiers, they were insurrectionists. The second section looks at the use of the memory of the Crater by the Confederate general who led the counterattack. General William Mahone rose to political power after the war based on an alliance between lower class whites and newly enfranchised African Americans. This made him a target for white supremacists throughout Virginia. His one shield was his notoriety as the Rebel hero of the Crater. His opponents attacked his war record in a 19th Century version of Swiftboating, but Mahone was able to control the historical memory of the battle to his own advantage. The third section of the book looks at the writing out of the African American role in the battle and the whiting out of the murder of blacks. Visitors to the battlefield for three-quarters of a century would have learned nothing of what really happened there. They would be served a reassuring narrative in which white men on both sides fought one another in manly conflict and reconciled after the war was over. The men who fought there were all heroic, all decent, and all white. The desire to maintain the fiction of the Civil War as a whites-only episode in our history was so strong that when the 100th anniversary of the battle came in 1964 during the height of the Civil Rights movement, most events were cancelled rather than allow blacks to intrude on the celebration of white masculinity that was to have taken place. As late as the 1970s, National Park Service personnel were not versed in the role of blacks in the battle and local African American college students said that the main purpose of the park was to glorify the Confederacy. Real change in interpretation at the battlefield park was spurred by the release of the movie Glory and the airing of Ken Burn’s Civil War just two decades ago. These two works were the first time many Americans learned of the key role of blacks in the war. Levin concludes with a look at how scholars and the African American community have reintegrated the role of black soldiers into the interpretation of what happened when Union troops rushed forward into the Crater. Kevin Levin’s book is a wonderful examination of a battle that throws American racial politics into sharp relief. It examines the complex interaction of a historical event, how it was remembered by whites and blacks, and what was forgotten and why it was relegated to oblivion. The recovery of memory is part of the book’s optimistic conclusion. This entry was posted in Uncategorized and tagged Civil War. Bookmark the permalink.